so, i'm making cakes now. well, that's not entirely accurate. i'm making some cakes and a hell of a lot of mousses and gelees, with a jam or a cremeux thrown in for good measure. also, i keep forgetting to take photos of these, because i just keep eating them so damned fast. up top there's the raspberry silk cake. 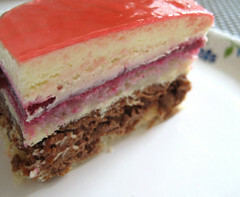 it has a almond dacquoise bottom, topped with a chocolate royaltine crunch layer, then another almond dacquoise and a raspberry gelee followed by a whole lot of white chocolate mousse. this one is awesome. 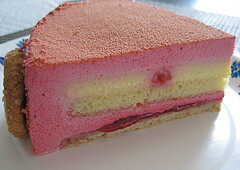 next, you have the framboise cake. this one has a layer of almond cookie, topped with raspberry jam, then a layer of raspberry mousse, pain de genes - an almond cake that made the kitchen smell absolutely heavenly, followed by a layer of vanilla cremeux with candied raspberries floating in it and finally topped off with more of that raspberry mousse. it has shortbread type cookies called diamants all around the sides. this one is also awesome. next is the banana pearl cake. this one starts with a layer of chocolate rice crispy treats, then some ganache and a chocolate cake layer, next there's caramelized bananas with rum and it's covered with a vanilla bavarian. it's glazed with a chocolate mirror glaze which is just basically poured all over the cake and then carefully, yet deliberately leveled off. this one is awesome, though in my opinion, not quite as awesome as the first two. finally there's the chocolate hazelnut cake. 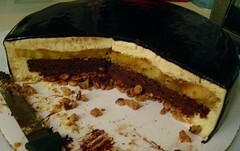 it is a layer of hazelnut dacquoise, caramelized hazelnuts, hazelnut mousse, chocolate cake, and chocolate mousse. this one is also covered with that chocolate mirror glaze and is so rich i could only eat a tiny little slice. so, not surprisingly, this one is also awesome. chocolate came and went so fast. 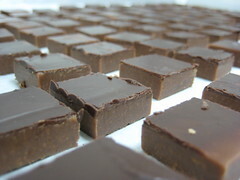 well, i spent two weeks making ganaches, and casting, cutting and dipping them, as well as molding chocolate shells, then filling them with ganaches, and closing the shells and finally packing all that stuff up to be given away to charity events and whatnot. 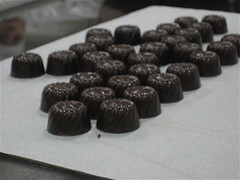 in the midst of it, i didn't think i liked it very much, but now, with the benefit of hindsight, i realize that those were a couple very calm, relaxed weeks in the kitchen, and i learned a ton about chocolate and how to deal with its persnickety tendencies. oh, yeah, i'm talking to you, cocoa butter.